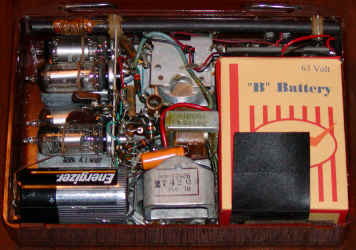 I recently purchased a couple of old battery-powered tube radios on eBay with the idea of using their cases to house a transistor radio project. 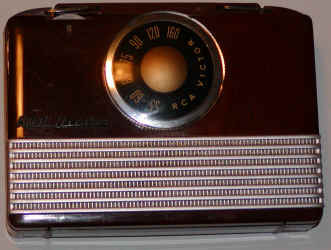 But these radios were so nice that I couldn't bring myself to tear out the insides! Instead, I decided to refurbish them. 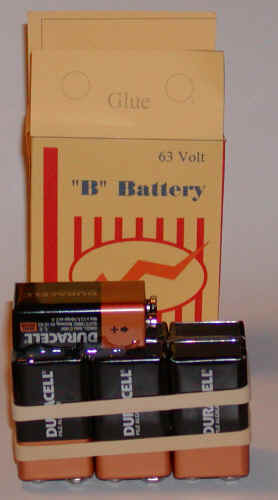 But there is one problem with these classics; they require "B" batteries. 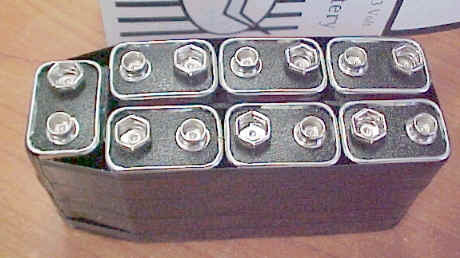 These batteries supply the plate voltage for the tubes and they are typically 67.5 volts and such batteries are no longer needed in consumer electronics. So, instead of paying an exorbitant price for a "B" battery from a specialty battery manufacturer, I decided to make my own. 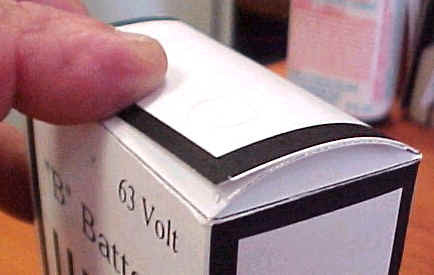 The housing for the battery is simply made from heavy paper cut and glued to make a box and the high voltage is obtained by connecting several 9 volt batteries in series. A PDF file has a couple of designs for the battery case. Print the one you like onto heavy paper, cut it out as indicated, fold it up, and glue together! I found it easiest to glue the large side first, then the bottom flaps, reaching inside with a ruler to press the bottom flap down against the tabletop. 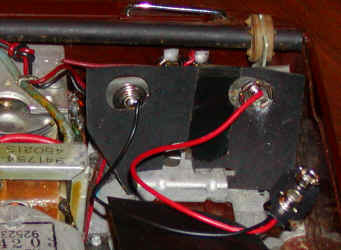 If you happen to have the standard B battery connector, cut out the indicated holes and secure the connector to the inner cardboard with glue and the battery is ready to install. In order to work with my non-standard battery, I modified the connector in the radio by soldering another battery snap to the older battery connector by connecting the black wire to the smaller male connector and the red to the female. Solder the wire to the inside of the connectors where the rivet is located in case you want to return the radio to its "natural" state in the future. This mod is harmless, soldering those rivets is a good idea, anyway! 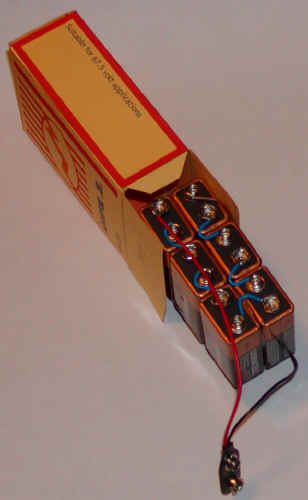 This particular radio uses four tubes and draws about 5 mA so this battery should last a long time. So now what am I going to put my radio project in? Thanks for the site on the "B" battery. I knew how to make a package but I really like the fact that you designed the box! 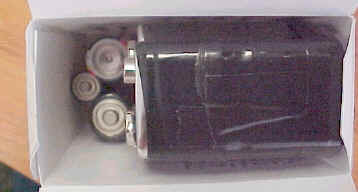 Add a Rayovac #840 4.5 vdc Computer clock battery. I found one at a swap meet for $1. 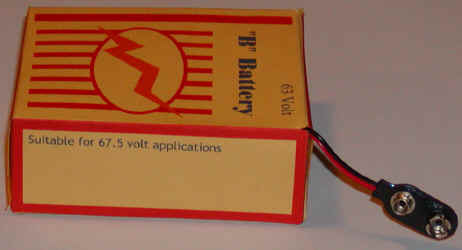 and with the additional 7 - 9 vdc batteries, it makes a total of 67.5 vdc. I know that the additional 4.5 vdc will not make a big difference but it is nice to have it complete. I made the battery pack a bit differently than you did. The Rayovac is down at the bottom at the left. I plan on soldering the 9v tabs together on the sides and then covering them all with a single layer of PVC tape. 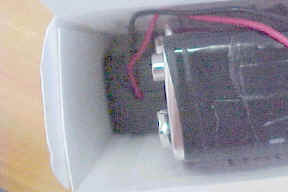 That way I still have the room so that I can lay the AA/AAA pack on top and just wire it into the series. Once again, thanks for the package design. My friend/customer will love the fact that I got his Tom Thumb Camera/Radio to work.